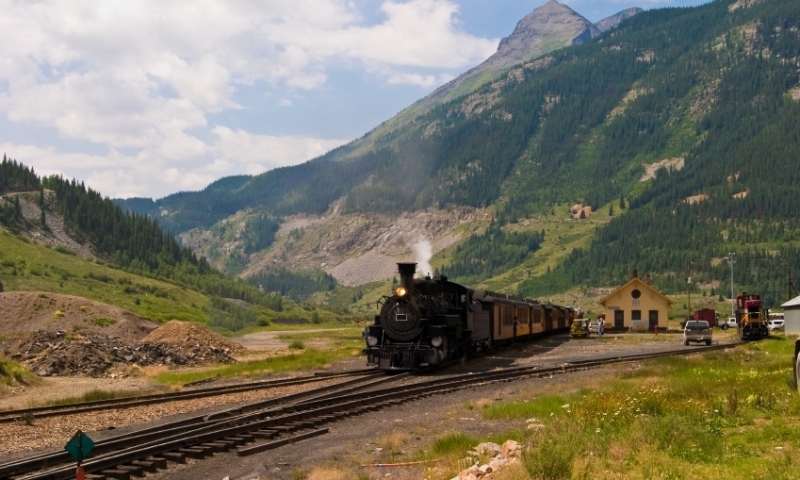 The Durango Silverton Railroad is a spectacular journey through the heart of the San Juan Mountains, offering breathtaking views of truly unspoiled high-alpine terrain. The Royal Gorge Route Railroad offers themed dinner and lunch rides, along with a scenic view of the Arkansas River. The Durango Railroad runs from May through October. The Silverton train route is 45 miles and about 3 1/2 hours each way. There is a two-hour layover in Silverton. Prices depend on which style cabin you prefer, and book ahead to make sure tickets are available. Originally constructed in 1879 to haul silver and gold ore out of the mining-rich San Juans, the train now shuffles passengers 45 miles through narrow canyons, stunning peaks and wild mountain vistas. The Durango Silverton train route runs 45 miles and can be boarded in Durango or Silverton. For recorded phone information call 303-639-1111 or toll free at 877-315-7623. The Durango train runs from May 6th to October 28th, 2017. It departs Durango daily at 8:45am. Additional trains run in the peak season. Fares range from $89 for coach cabins to $199 for the boutique-styled presidential class cabins. Children aged 4-11 can ride standard class for $55. Silverton offers the charm of an original mountain town. During the two hour layover, check out the mining museum or stop by the Silverton Brewing Company draft house, a relatively new brewery that is producing some seriously good -- and award-winning -- beer.